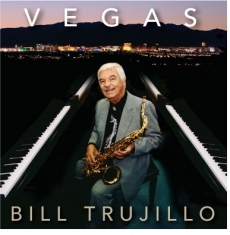 The collection was produced and executive produced by Bill’s son Nick Trujillo (www.nicktrujillo.com), who despite growing up in a musical household, successfully pursued a career in academia before entering the independent music world in a unique way several years ago after his wife died of ovarian cancer. A professor of communications at Purdue, Michigan State, Southern Methodist, and Cal State Sacramento for 30 years, Trujillo—inspired by the songwriting and production courses he took at UCLA Extension—has recorded two CDs of quirky songs (Is That Viral Enuf 4 U?, That Is (Still) The Question) under the name Gory Bateson, the mythical nephew of the late British anthropologist Gregory Bateson. With Vegas, Nick adds acid jazz and bebop to his eclectic catalogue.